On Tuesday 22nd January students from Stockland Green School attended the latest Reach Higher event at Redpoint Climbing Centre. During the session the Year 9 students worked on goal setting, focussing around revision and their next steps at school. The students then took part in three activities to put these discussions into practice. The Leap of Faith – Helping students overcome their fears by jumping off a platform and attempting to touch a giant space hopper ball. 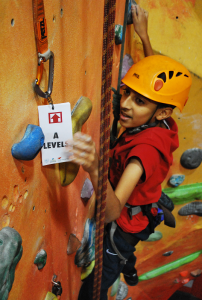 Climbing the ‘Wall of Success’ – Student’s climb up rock wall and collect their educational qualifications on the way. Bouldering – in a ‘rope free’ climbing experience young people use their problem solving skills to find the best route forward. These Reach Higher events run throughout the year so take a look on the Activities page for the next available session.